I’ve been excited for this event for a little while now and I’m excited to be sharing it on here! 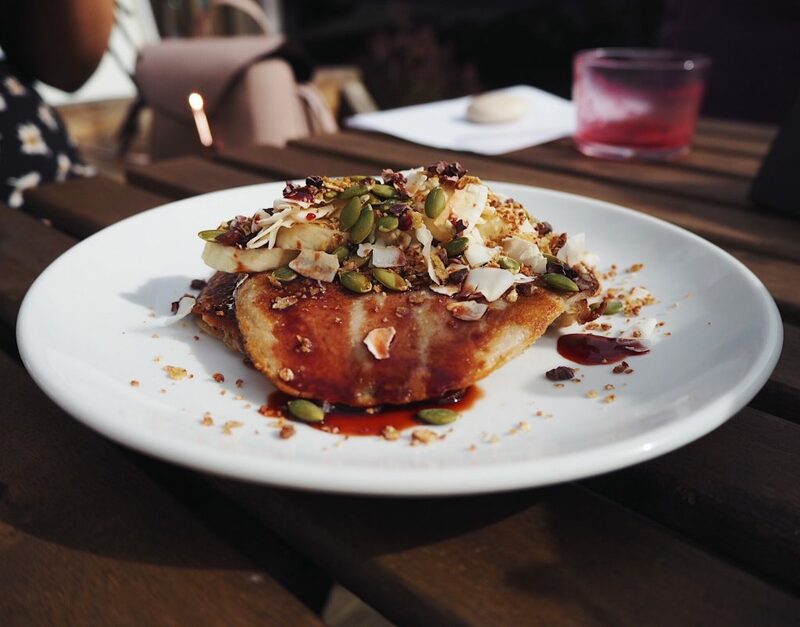 Some of the bristol bloggers went to brunch at a fabulous food establishment called Beets N Roots located on Cotham Hill which is just behind Park Street. Now, I must say this was extremely out of my comfort zone for a few reasons. I love fruit and salad, I’m not the biggest vegetable fan but it’s so rare that I eat a meal that is infact vegan. There’s usually always some sort of meat or dairy on my plate due to the fibre in a lot of vegan food completely messing with my digestive system. If you’re a regular reader of my blog you’ll know I have a chronic illness called Inflammatory Bowel Disease and part of having this means my body struggles to digest certain foods. Trigger foods are different for each individual with the disease but pretty much anything natural is a common one among sufferers. It doesn’t mean I don’t enjoy the food because I really do, it just means my body doesn’t join in with the party happening in my mouth when eating the food. Quite the opposite really. However, I’ve really been trying to find some healthier foods recently that my body does agree with as I can’t live off of chicken nuggets, as much as I would secretly love to. So really this little event was a godsend as I got to try some amazing things! On arrival we were greeted with the choice of two scrummy superfood juices. One being orange, turmeric, ginger and carrot and the other beetroot, apple and lemon. As the orange one had more anti-inflammatory benefits in, I decided to go for that one and it was more than delicious with the prominent flavour being orange with a slight hint of the rest of the ingredients. After a quick introduction and chat with the manager, Becky and I headed back out to the front of the café to take a few photos of the place and its offerings. We were very kindly offered a complimentary dish of our choice off of the breakfast or lunch menu. 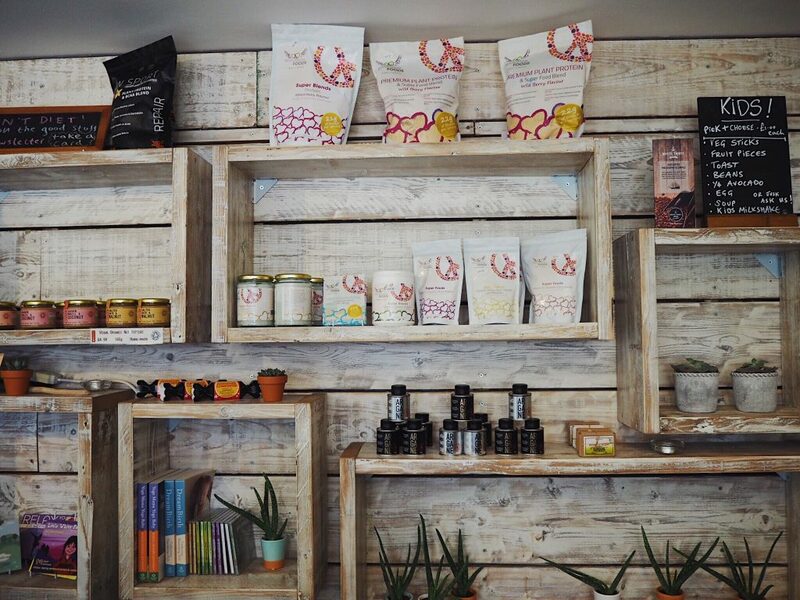 Beets N Roots have a new menu that has just been launched for Spring that they created alongside a well-known and established nutritionist Rosie Letts. Rosie was present too and gave us a very interesting talk on the inspiration and nutrition behind the scenes of it. 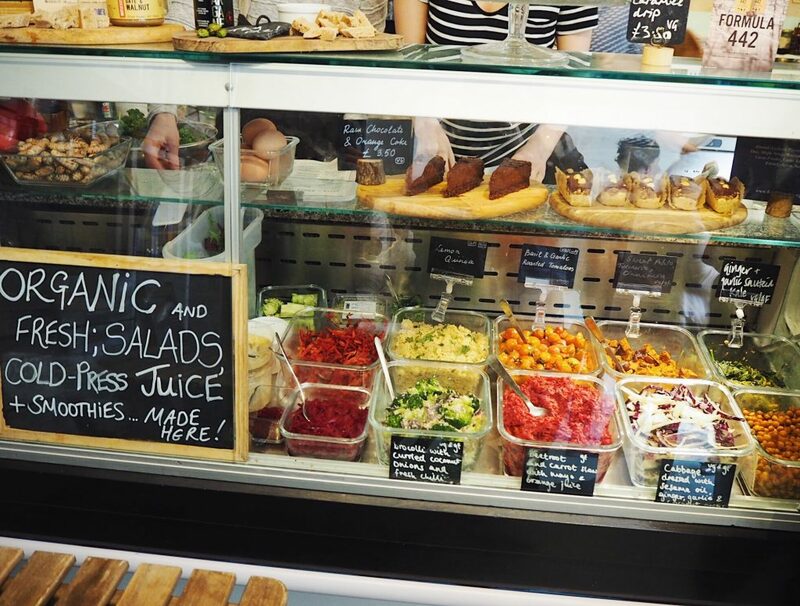 Beets N Roots offer cold-pressed juices as most of the juices in supermarkets are heat pressed to make their shelf lives increase by huge amounts. By heat pressing them, it removes enzymes that the body could really benefit from so it’s much better for our systems to have them cold pressed. 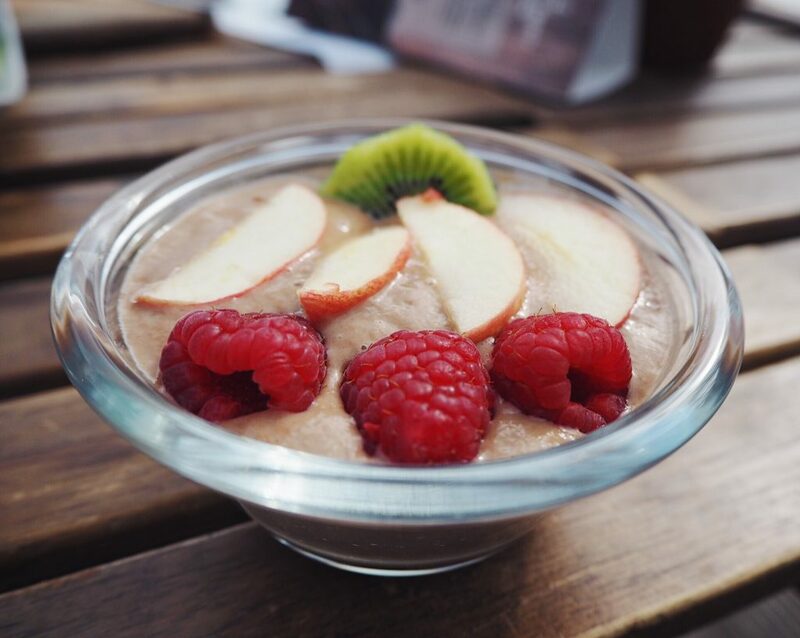 Beets N Roots meals are mostly raw to maximise the nutrient intake for the body. Surprisingly, cooking most food can decrease the goodness in it so in that sense, their meals are basic to reproduce at home but not at ALL boring due to the fresh taste and beautiful natural seasonings they use. 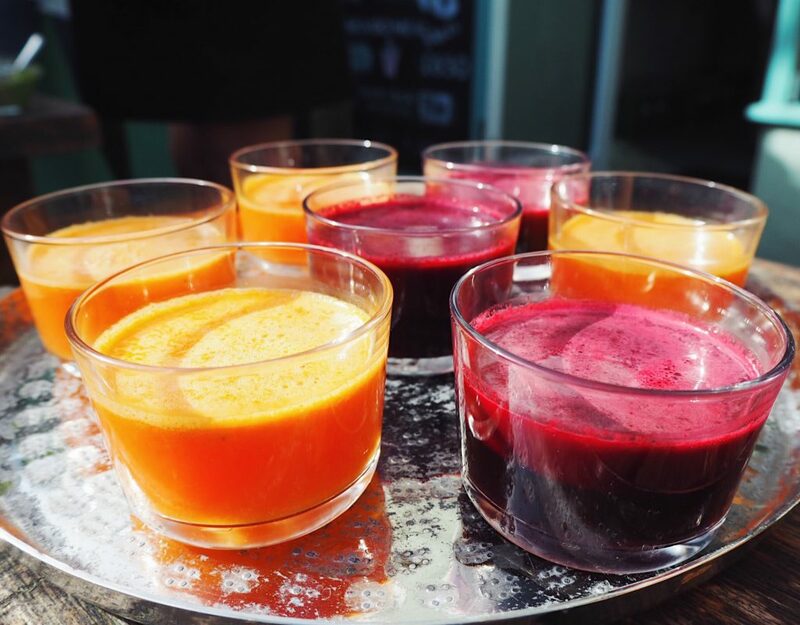 The three main juices Beets N Roots offer are – Immune boosting (orange, ginger, carrot and turmeric), alkalising (leafy greens, celery, cucumber, apple and lemon) and helps circulation in the body (beetroot, apple and lemon). 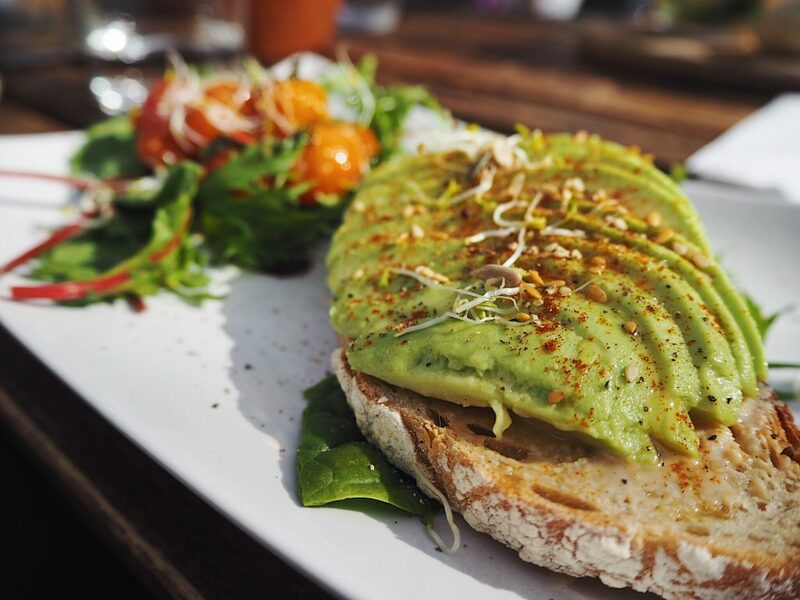 The dish I chose was avocado and tahini on sourdough toast sprinkled with china rose sprouts, paprika and cracked black pepper served with leaves and basil and garlic roasted tomatoes. I’ve never properly had avocado and I wanted to go for something that I’d never tried before, it definitely paid off. The dish was so gorgeously served that I felt a bit guilty breaking into it and everyone around me felt the same about their lovely dishes too! The main vibe was earthy with sweet flashes throughout from the tomatoes. Such a subtle sprinkle of paprika added another dimension to the dish and sourdough was the perfect crunchy companion for the soft avocado. Here are a few of the peoples meals around me that they kindly let me snap before devouring. 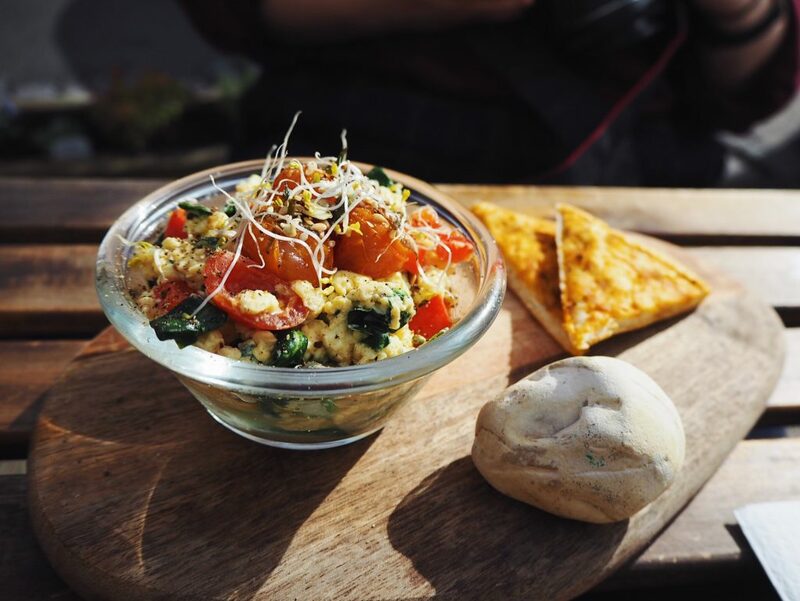 This dish is the scrambled egg with spinach, basil and garlic roasted tomatoes and served with toasted flatbread. 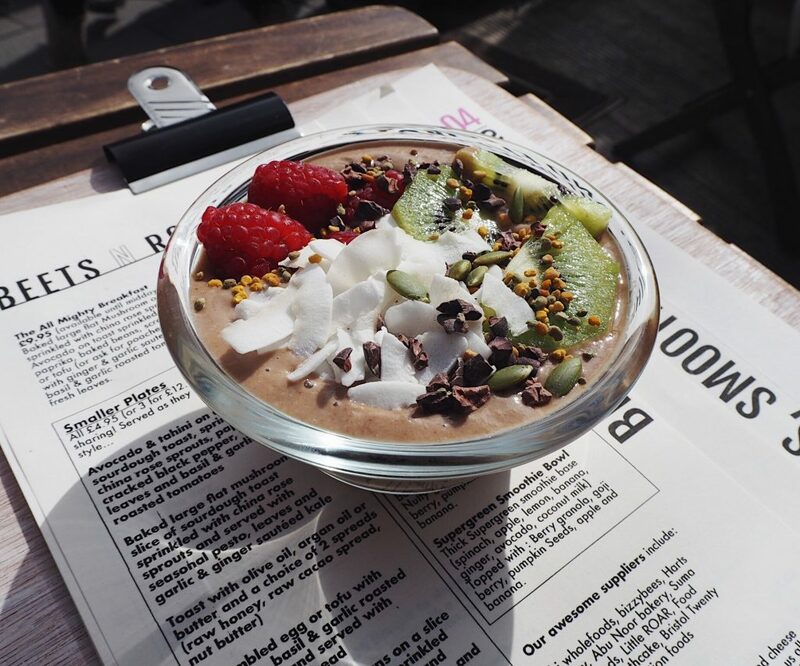 This is buckwheat pancakes with banana, chocolate and maple syrup, sprinkled with coconut shavings and pumpkin seeds. 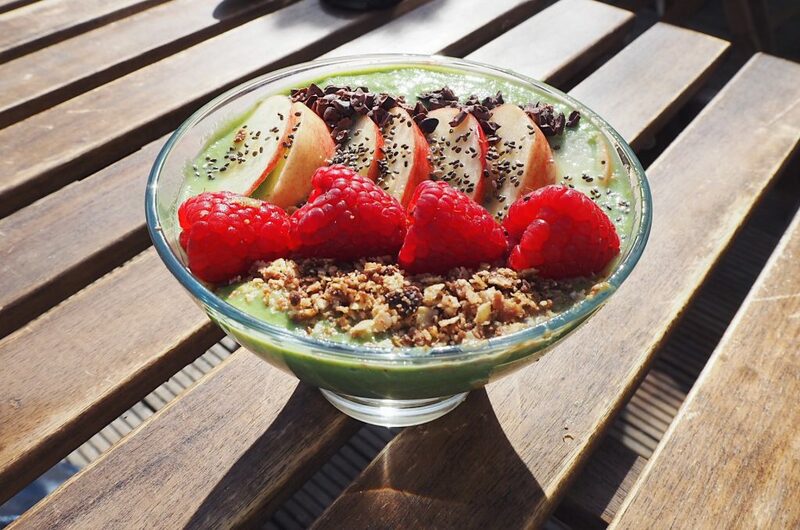 And this is the Supergreen Smoothie Bowl which is spinach, kale, banana, apple, lemon, avocado, granola and coconut milk. Despite being highly satisfied with my meal, the smoothie bowl station was calling my name too. For the purpose of the blog and that only of course, I just HAD to make and try one! After a little more photo taking, mingling and deciding to buy a slice of a certain cake sat on the counter inside, we grabbed our fabulous goodie bags along with a free smoothie and headed out. The bag contained a lovely little salad pot with gorgeous seasoning and little tomatoes in aswell as what I can only assume was a cute little superfood truffle! We also got a voucher to come back with a friend for a complimentary brunch and a 20% off voucher to give to a friend. Jake and I are hopefully heading back tomorrow to use our voucher as there is so much I would love to try on the menu! 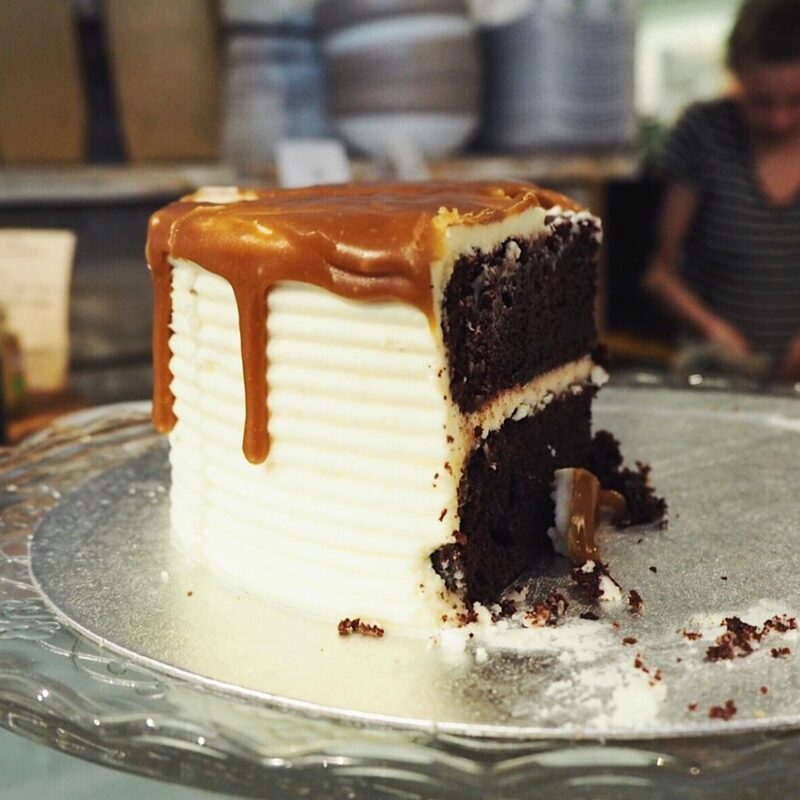 And I’m not going to lie, I’m kind of hoping they have another one of these cakes… (It’s a caramel, chocolate and vanilla drip cake). 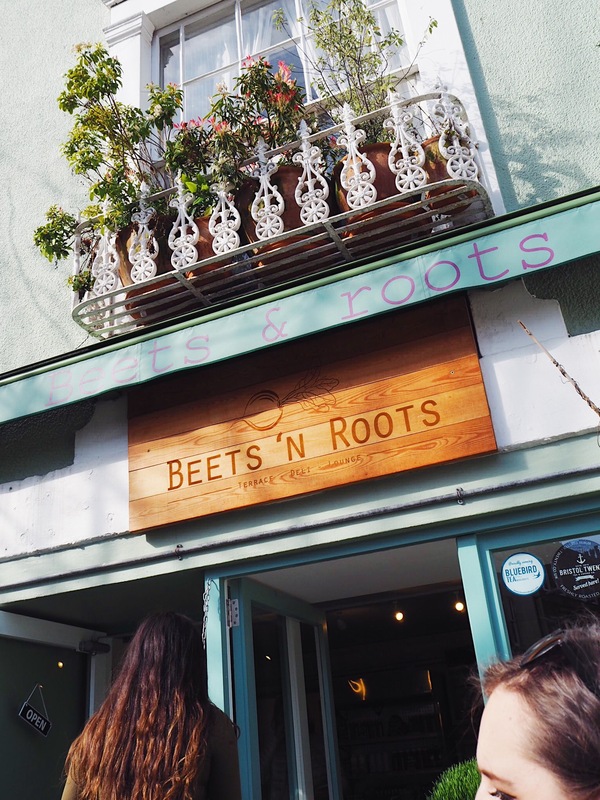 A huge thank you to Beets N Roots for hosting such a fun and thoroughly food-filled event! And also to Socialight and Heather for setting it all up. How do you feel about super healthy, delicious and nutritious organic food? "My Boyfriend Reviews Bomb Cosmetics!" Everything here looks so yummy and delicious. I see you enjoyed a lot. 🙂 lovely post with such yummy pictures. 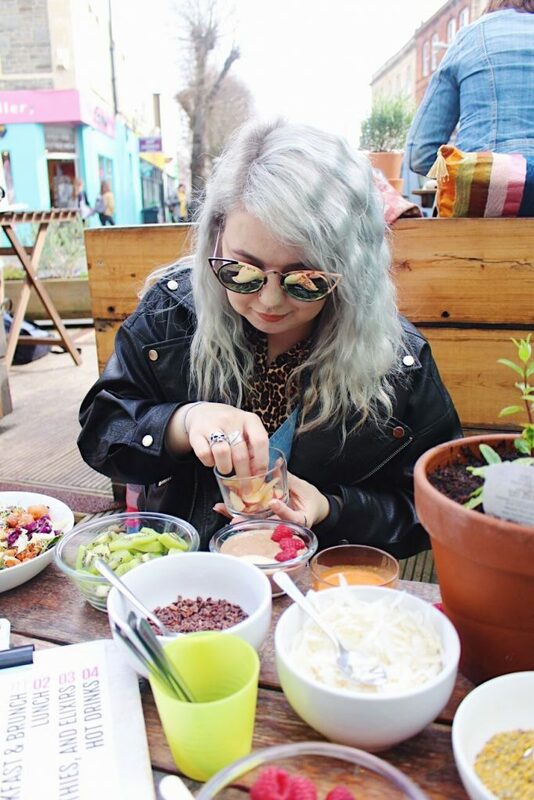 It’s so cool that you got to attend a bloggers brunch event! Their food looks super delicious! I don’t mind having vegan food if the chefs can make it tasty. Thes superfood juices look delicious (I am a total sucker for beets). Your avocado toast looks delicious as well! I am so in love with the food! Thanks for sharing your experience :). There’s not secretly about it – I’m fairly sure most of us would love to live off chicken nuggets (and cereal, can’t be without cereal now, can we?!) ?? ?‍♀️ I actually can’t get over how delicious the food looks here! I wish I ate more healthy foods, but I really struggle with textures – weird, I’m aware – so I can’t stand avocados, tomatoes, or basically anything that’s considered to be healthy. That cake is probably heaven on a plate for me though, I adore literally anything that has caramel in it or on it.. ? Girl, you’ve been to some really gorgeous restaurants recently, I am super jealous and constantly hungry! ? Wish there were more independent places like this in Milton Keynes. The food is gorgeous and the layout is so cute too!